We know that tweens and teens are really, really good at texting. Texting while walking, texting discreetly in class, carrying on multiple text conversations at once. But is there a difference among kids in who texts the most? Turns out that it’s no coincidence that both the winners and half-dozen finalists in the 2009 and 2010 LG Texting Championships have been female. Girls do the bulk of the texting the majority of the time, specifically teenage girls. Girls are, first of all, more likely than boys to own a cell phone. The Pew Forum reports that 77% of girls 13-18 have cell phones, versus 74% of boys. (I’m wondering if that’s because more girls buy or request them, or because parents are more worried about their daughters than their sons in general). For kids who own mobile phones and use them to text, the incidence of texting increases with age but also with gender. 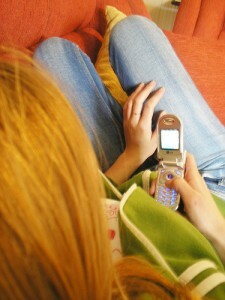 Older girls are the most active: 14 to 17 year old girls report sending and receiving 100 text messages a day. Why are girls particularly drawn to texting? It’s probably because females are more relationship-oriented and more apt to communicate with their friends using whatever medium is most easily available to them: in this case, the text message. Remember those days before cell phones, when teen girls across America were hounded by their parents every evening to stop tying up the landline talking to their friends for hours? Those were the days.